Alain Bertaud is an inquisitor. He pokes at data with experience and reflection to help us understand the way the world works, how it will change and whether it will be the way we want, or not. The image (right) is one of those pokes skipping across the blogosphere like it was searching for people willing to deal with the “or not” problems. I came across Mr. Alain Bertaud because I was trying to make sense out of the Global Commission on the Economy and Climate report entitled the New Climate Economy. My question was how and where to invest the estimate of $90 trillion around the globe. They see it happening in three structures: 1) the city, 2) food/water and 3) energy. What in the infra is missing in this approach? I would put “wilderness” defined as a structure untouched and because it is a simple image. You see urban densities change in the blink of the planner’s eye. 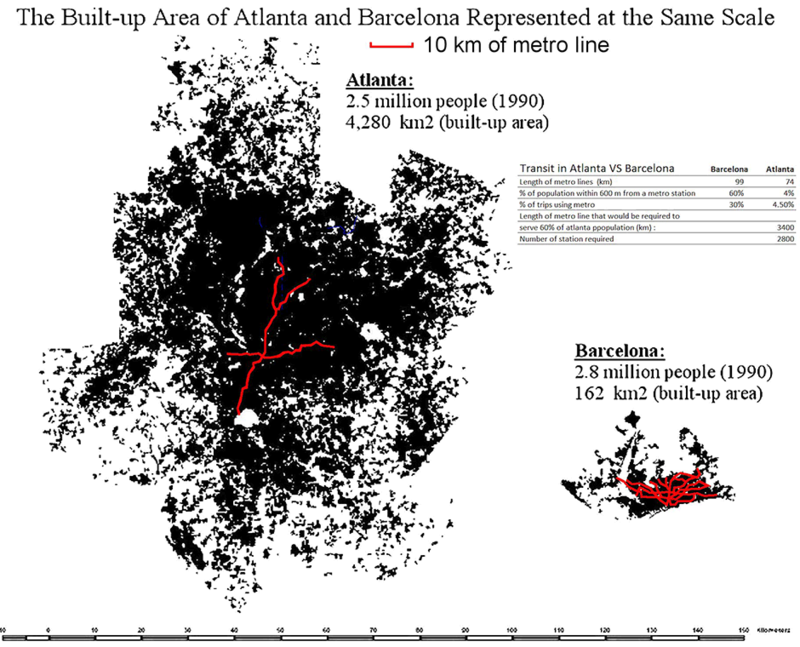 The difference between Atlanta and Barcelona drawn down by Bertaud is in the red line. One puts a train station inside a 2,000-yard walk for about 60% of the population (Barcelona) for in Atlanta just 4% have that choice. Atlanta’s planners made highways for single families. Barcelona made neighborhoods for large, super extended socio-economic families.